Services | Mail-O-Matic Services Ltd.
Mailouts, admail, direct marketing campaigns, and regular mail are integral components of your business; however, they require valuable time and energy to complete successfully, which is why you should trust all your mailing requirements to an experienced mail services provider. Since 1967, Mail-O-Matic has been a complete mail services provider for companies of all sizes. Our knowledge and production infrastructure is designed to help you save time and money by taking care of all your mailing needs, from the tiniest details to the overall picture. We have a wide range of flexible services and options at various price points to accommodate any size budget. 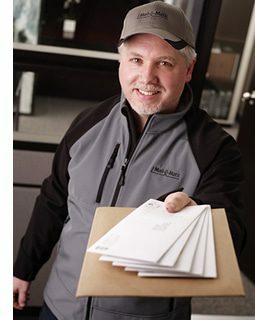 Take advantage of our experts overseeing all your mailing necessities, so you can concentrate on growing your business and improving your bottom line. By trusting Mail-O-Matic as your one-stop mail services provider, you have a company that watches your back and does everything under one roof. When we manage all of your mailing and direct marketing needs in-house, we are helping you reduce your costs on USA, international, and Canadian postage rates. Our high standards of quality control take care of all your mailing needs. The result is your advertising, messages, and communications reaching the proper people effectively and affordably. Our stress-free solutions give you the freedom to focus your energy elsewhere. Mail-O-Matic works hard to maintain our reputation as the mail services provider that helps you maximize your return on your mailing and direct marketing investment. Our experienced staff is available to answer any of your questions and advise you on the best mailing and direct marketing solutions today.